madness00 wrote: Did you not read my definition of keeping me in check? It has nothing to do with control. I'm too tired to keep arguing over this $#%^. If you want to keep the fantasy that you had control over parents who were keeping your behavior in check. Good luck to you. I'm done, I'm off to bed. Having personality disorders is considered a chronic mental health issue, especially when you've got a disorder like AsPD because it really does fuk up your life. That's a victim statement if I've ever heard, displacing blame and making excuses for a life of failure. I doubt my PD's alone qualified me for disability support. They may have contributed to it though with the wording my psych used in his report letter. 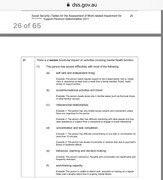 He mentioned that there's a poor chance of recovery. .
here is the 65 page paper released by Australia showing criterion for work disability. While you're correct with saying a PD such as ASPD alone wouldn't get you these benefits, but being on the spectrum most certainly could and would have next to no chance of recovery. I didn't try to claim that AsPD was my only issue when I applied for disability. I'm not going to go into everything I spoke to the assessors about because that's my business and not all of it was entirely true..
Why not? I thought this is the only place that you can be open and honest, so what's the point of omitting certain facts, that are most definitely pertinent to your psychological profile? You can't cherry pick what you say, while omitting so much and claim to have full disclosure here, as this is the only place you can be YOU, right? Contradictory to say the least. I know you think AsPD is some kind of badge of honor, but I don't. I've been living with it, so I know for a fact it's not..
Was that statement of yours indicative of being prideful in those actions? I'd say so as you knowingly said that to illicit some sort of reaction from him, that brings you pride and joy whether or not your recognize it. Same as when he flinched as you leaned towards him and times when you made dogs cower to piss themselves, the way you talk about these things overwhelmingly portray someone proud of doing such things, which aren't anything to be proud of and write home to mom about. The psychologist who diagnosed me with AsPD and schizoid PD was qualified, and I was honest with him (as much as I could be anyway) so I can assume his diagnosis was accurate. See, why don't you bring up your schizoid PD up as much? Considering its in a completely different cluster, A instead of B like ASPD. Do you not realize he could just be appeasing your delusions and telling you that you're ASPD? While they have some similarities, there are key distinctions between them, which would be the difference of you being able to stay on government assistance your whole life or not. Are you also not aware of the overwhelming comorbidity/similarities of schizoid pd and autism/assburgers? Your low iq during neuropsychological testing is what landed you in cluster A. What do you estimate or wanna portray your iq as? You do also realize, between your 20,000 posts as weeper, and almost the same as demon over the years, the subconscious disfluencies in your writing come through. Just like your autisticly repetitious writing with cliche and cringey quotes. Like a moth drawn to a flame is one of my other favorite stolen cringey quotes that you subconsciously way over use. Mix that with the video chat (that you hid your face from like a coward) with Caine who made you look like a fool, even Helen Keller could see that you fit around 20-29 autisitic traits that I listed and it would probable me more if I had videos of you to see your motor functions. The psych wouldn't ever tell you this, as you're disabled, and thus so, must have a legal guardian, whom I presume is your mother still, hence why your psychologist shares things with her, just as they do with children. Only a matter of time until you regress to needing diapers again, if you're not already there. He wasn't the one I had to convince to get on disability support. The assessors at centerlink were and it was easier to cheat the system back then. They've made it harder to these days..
How long have you been spoon fed by the government, 28 or so years? In what ways did your cunning and manipulation benefit you if you truly have these disorders and were honest with them? Once again this is the one place you claim to be able to expires yourself so let me into the mind of a master. It wasn't the job of the assessors to diagnose me. It was only their job to assess my eligibility for disability support based on my medical and psych reports (they didn't fill out those reports. My doctor and my psychologist did).. Which once again, looking at their criteria, likely have placed you as severely or possibly extremely disabled because of the schizoidtism cocktail you have going on. Once again, which of their criteria do you think fits you better, severely or extremely disabled? I know this is a lot of introspection for you, but i have faith. But to be in it for as long as you, I can't imagine your government expects you to get back to the work force anytime soon. I know you have to go every X amount of months to be reassessed by your doctors, which the conclusion is always the same, severely mentally disabled with no chance of independent living. No, it wouldn't. You're not a psychologist. No actual psychologist has ever told me I have autism. Go figure..
Because they wouldn't tell you, instead tell your legal guardian, mommy dearest, and inform her that your autism is causing delusions and consuming your special interests causing you the deep yearning to be called ASPD, or even better a psychopath. I'm not sure how being labelled with a personality disordercan fuel anyone's ego. Do you understand the definition of a disorder? . Your IQ is showing again. Would recognition of being different or "special" not inflate their ego? What does it do for you after tens of thousands of posts of the same redundancies and failure to change. You're using the word disorder as your crutch for being a failure in life, in which you have so much you'll never get to do before you die as a result of constant reliance martyr like mentality. There are people with far more debilitating ailments who manage, you're just lazy and autistic. Claiming to have psychopathy (even though you've never been tested for it) fuels your ego. You go on about me having AsPD, but you're the one who's been trying to convince people you're a psychopath, always going on and on about your head trauma, even though it doesn't prove you're one at all. Me, I'm willing to accept that I may or may not be a psychopath. You think self-diagnosing yourself is accurate. I don't. . I'm not claiming it, but I have presented in the past what many professionals have agreed and constituted as Psychopathy as a separate entity. Which is, on top of ASPD behavioral traits, there is also certain neurological abnormalities in key specific areas that exist; this you have agreed on in the past. Now if the abnormalities, whether genetic abnormalities , hereditary dispositions, arise early enough on before adulthood and manifest as ASPD traits, then it should be considered psychopathy as a result of nature, which is vastly different from someone who develops nuero typically and shows the same behavioral patterns. Accepting this and what many scholars regarding, their is a pretty good consensus as to the origins of these kinds of behaviors in the brain. Many have talked about them in the past but sure it didn't interest you, but specific areas such as but not limited too; Amygdala, Prefrontal cortex, Limbic system, Diencephalon,Ventral Tegmental area, Anterior cingulate cortex, Hippocampus. I know, a lot of big words you don't care to know about. Also, unlike you I actually have and share my MRI's that show all of these structures, which are malformed and abnormal from the first two decades of living with the tumor. 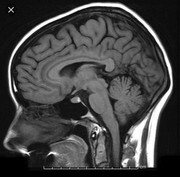 A good base line, to show a normal brain and size of the folds on prefrontal cortex. While mine, after years of intermittent moderate hydrocephalus had become compressed, thus helping perpetuate the personality dysfunction as all of the other deep lying subcolossal structures were adversely effected as well to accommodate the displacement being caused by the tumor blocking CSF flow through the ventricular system. It seems like you're the only one who disputes anything I have to say despite my overwhelming amount of scientific backing. I'm waiting for anyone other than you to dispute my claims, but silence is deafening and you stand alone. So if I bowed down and submitted to being psychoanalyzed, and someone wrote on a paper I was ASPD, did I have ASPD all along or once they diagnosed me? Can a Psychologist not evaluate and diagnose themselves with something? If I spent 5 1/2 years getting a masters in psychology, would I be qualified then? You rely so heavily on the influence of what others tell you, which to me shows reliance and thus weakness, which fits your persona well. I'm not the one trying to fuel an ego here..
Once again, your decades and tens of thousands of posts say otherwise. You're essentially fueling your ego fire with water and no one has bought your cringey facade in quite some time. Yup because you know that you cant deal with the truth, and god forbid you get one and they come back and say your brain is perfectly Normal, you'd probably kill your self. You like to live with the hope that your brain is different and that you're the one true psychopath. According to what criteria? I'm not severely disabled at all and I never said I was. .
Once agin, click the provided pictures and actually read. You're not here to learn. But try to shut down anyone who goes against anything you're trying to present and deviate with nonsensical, irrelevant circumstantial and unfounded emotional statements to get away from the truth as fast as you can. The faster you can bury it the better, hence why you'll reply to this then quickly post in stupid threads like what are you listening to. Your attempt at childish insults show you're backed into a corner and are projecting your mental retardation on to me. Fine call me mentally retarded, but back those claims up. You make bold statements but always forget to back it up, thus nullifying your statement. But I'm here to actually share first hand radiological and operative reports about my tumor, that as much as you can't admit, were crucial in my psychological development. Just because your autism prevents you from grasping such complex subject matter, you automatically dismiss as irrelevant. Also there are a small number of people here whom I feel have a lot of good information to offer. I really just enjoy poking fun and your illogical retardation the most though, and it never fails to amuse. You clearly have no real understanding of personality disorders. It's no wonder you think they can be worn as a badge of honor. Actually I can, since it is my personal business. I'm not obligated to share everything about my personal life here. In fact, I'm not obligated to share any of it, so be content with what you get. Because this is the AsPD forum, not the schizoid one. No it didn't, lol, because I don't have a low IQ for starters and you certainly don't need to have a low IQ to be diagnosed with any personality disorder, regardless of which cluster it's in. Some of the bullshlt you come up with amuses me. You're so naive. 125 last tested, which I have no doubt is higher than yours, but don't worry, I'm sure you're a genius in your own mind. Hate to shatter your twisted little fantasy of me (cause I know thinking about me excites you), but I'm not disabled and I don't have or need a legal guardian. And yet, strangely enough I have no problem living independently and have been for many years now. I actually haven't been reassessed since I first got on disability. I'm not sure why, but it suits me fine. No they wouldn't because that would require actually having one and I don't. You're talking about a bunch of professionals you've never personally spoken to and have never personally spoken to you. Thy did'nt test you and have never, at any point, told you that you might be a psychopath, so stop dreaming. Your brain injuries could relate to a number of issues which have nothing to do with psychopathy but you're so determined to be a psychopath that it's blinded you to anything else. That only proves you're brain damaged. It doesn't prove anything else and you certainly can't diagnose yourself because you're not qualified to. Yet not a single scientist has ever studied your brain and told you that you're a psychopath. You're not an expert in brain imaging, so you can't make that assessment yourself. It makes more sense to put more faith in the opinion of a qualified professional who has studied mental health issues for years than it does in someone who has never studied them and lacks insight due to having mental health issues. Taking the opinion of a fully trained professional into consideration reduces the possibility of misdiagnosis. Obviously people can still be misdiagnosed by those who claim to be 'professional', but that doesn't mean you should diagnose yourself because you still lack the training to do so. You're really no better than that 'professional' who didn't know what they were doing. Actually, I'm willing to accept that I may not even be one. I suspect I am because of the amount of psychopathic traits I have, but I'm no expert in psychopathy, so who knows. You do a fine job of that yourself. Oh I know. You don't actually have anything of real value to offer here. It's so funny reading this... your replies Reaper just go to further prove your autistic tendencies. I mean your replies sound like someone who can't properly mentalist what is being said by the other person. He s not saying that low iq is a prerequisite for ASPD but rather that you landed there (read: misdiagnosed) due to your communication disorder most likely caused by autism or something along those lines. Now regarding schizoid, you are right. You can have a comorbidity so fair enough if you feel like posting on both forums. To be honest I'm not so sure if schizoid is as similar to Aspergers as your nemesis claims. Because there are usually no evident mental deficits or communication disorder, otherwise the diagnosis of autism would be more suitable if said deficits did exist in the patient. You always strike me as someone that is trying very hard to sound like an aspd. You could be a narcissist for all I know or just a loner with a misdiagnosis. Reaper wrote: 125 last tested, which I have no doubt is higher than yours, but don't worry, I'm sure you're a genius in your own mind. Online tests don't count, weeper. Is that how you got your AsPD diagnosis as well? Last time i check, you have never taken a real life IQ test, so don't lie to us. My IQ was tested by WAIS, and there's no way yours is higher than mine. Even by a mere three points. Being autistic isn’t that bad anymore reaper, you guys got Sheldon Cooper as a spokesman now instead of rain man. It’s a good time for you guys you should be celebrating your mathematical ways. ZombieZ wrote: Being autistic isn’t that bad anymore reaper, you guys got Sheldon Cooper as a spokesman now instead of rain man. It’s a good time for you guys you should be celebrating your mathematical ways. I had to laugh at that. Some of you guys need to worry about that more than I do, lol.